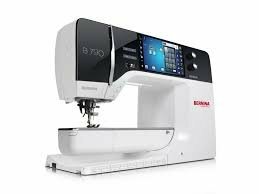 This class is for those who have purchased a Bernina 435, 475, 480, 535, 560, 570, 580, 590, 710, 740, 750, 770, 790, 830, or 880 from Asheville Cotton Co. We will go into more detail about the various functions of your machine, including the "I" information screen, etc. It is recommended that you take at least a few of the Machine Mastery classes first. We will start with functions that all these machines have in common, and as the day goes on, some of the lower model machines will be able to leave early.